Figure 1 :The false colour image is a map of the radio emission (at a wavelength of 1.3 cm) emitted from the region around the star HL Tau. The candidate protoplanet is marked 'b'. The bar at top left (marked 50 AU) indicates 50 times the Earth-Sun distance on the same scale, or about the size of the orbit of Pluto. HL Tau is located in the centre of the image. The star is surrounded by a dusty disc tilted to the line of sight and not visible here, but its boundary is indicated by the white ellipse. 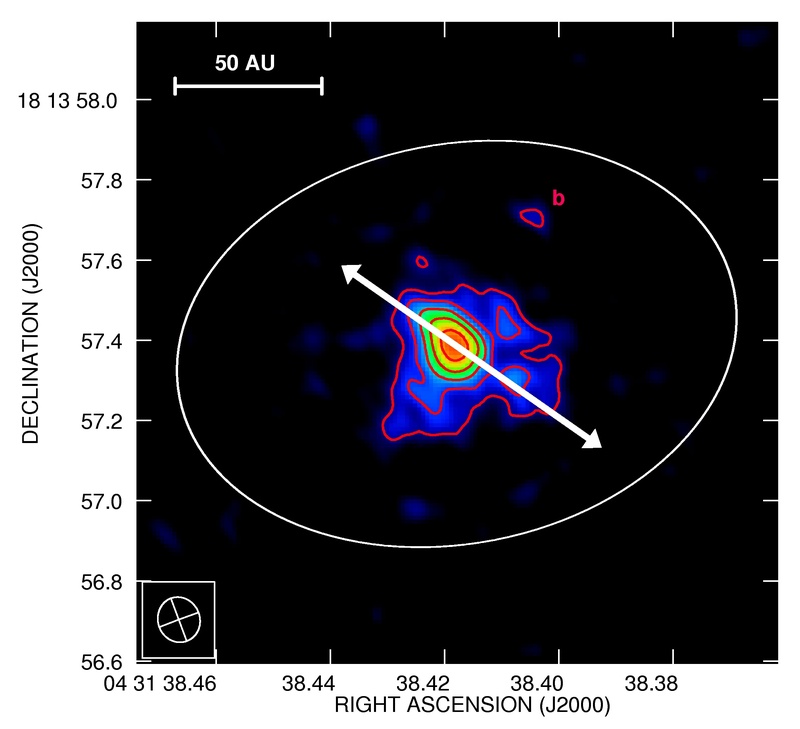 The arrows show the direction of jets of hot gas emitted from the forming star system (Image credit : VLA + Pie Town antenna). Figure 2 :This is an image from the computer simulation of HL Tau and its surrounding disk. In the model the dense clump (seen here at top right) forms with a mass of about 8 times that of Jupiter at a distance from the star about 75 times that from the Earth to the Sun (Image credit : Greaves, Richards, Rice & Muxlow 2008). Movie 1 :Movie showing the growth of the protoplanet in the disc around HL Tau. The total time is about 3000 years and shows the protoplanet forming at the edge of the disc, and then spiralling inwards to a distance about 75 times further from the central star than the Earth is from the Sun. The movie can be downloaded here (Movie credit : Greaves, Richards, Rice & Muxlow 2008).